Patient Lifts Are Strong, Reliable, And Easy-To-Operate. 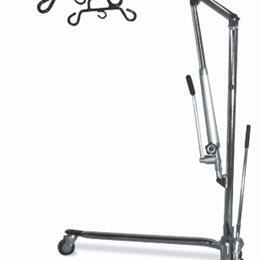 Medline’S Patient Lifting Equipment Includes Elevating Lifts, Stand Assists, And Comfortable Resident Slings. We Know How Important It Is To Keep Employees Safe And At The Same Time Provide Secure Resident Care. Medline’S Patient Lifts Accomplish Just That. The Elevating Lifts Are Available In Both Hydraulic And Electric Versions. The Base Legs On Our Lifts Spread With A Reliable Easy-To-Operate Foot Pedal, While The Low-Profile (4.7") Base Legs Easily Move Under Beds And Other Furniture. Electronic Lifts Use 24V Batteries That Provide 80-100 Lifts On A Single Charge. Charger Bags Are Included. The Controls Are Easy-To-Operate And The 6 Point Sling Cradles Provide Flexibility For Maximum Comfort And Safety. Emergency Switches On Elevating Lifts Are Included. The Hydraulic Elevating Lift Comes In A Hammertone Gray Finish. All Other Lifts Are White Powder Coat Paint. All Lifts Carry A 3-Year Warranty. 400 Lb Hydraulic Elevating Lift (Includes Sling), Overall Base Height 5.5", Outside Width Of Base 31.5" Open/26" Closed, Inside Width Of Base 33.5" Open/ 22" Closed, Overall Length 42"